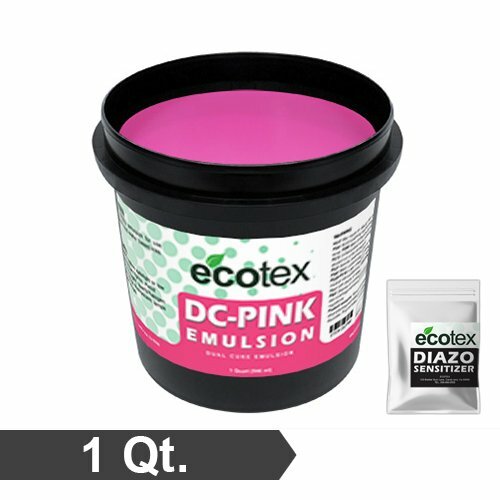 Ecotex DC-PINK is the ultimate Dual-Cure Textile Emulsion. This product is compatible with all ink systems. It is highly resistant to solvent, UV, Plastisol, & Short run Water Based inks. Before use, Diazo must be added and allowed to activate emulsion. It's easy, just see Diazo for simple Instructions. Once the Diazo has been mixed it is ready for use. Apply to clean, degreased, dried screen with a scoop coater. Be sure to use appropriate application techniques. Reclaiming Ecotex DC-PINK is easy with Ecotex Emulsion Remover. For long runs over 1,000 shirts - use Ecotex Emulsion Hardener to extend the life of your stencil.